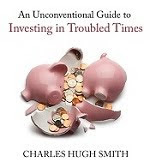 oftwominds-Charles Hugh Smith: Is It Time to Get into Crash Positions? Maybe this flight won't go into a tailspin; perhaps it simply runs out of fuel. With stock markets diving around the globe, a pressing question arises: is it time to get into Crash Positions? After a dizzying 500+ point drop in the Dow on Friday, should we brace for impact? There are plenty of fundamental and technical reasons to view the swoon this week as the initial downturn that presages a crash landing. But if we look at the last equivalent spike down in October 2014, we're not so sure. Both spikes (October 2014 and August 2015) smashed through the lower Bollinger band, but the volume in last week's plummet was nothing special compared to the 2014 swoon. Big moves have a bit more credence if they're accompanied by massive volume. This leaves the door open to a sharp rebound, i.e. what followed the spike down last October. The Put-Call Ratio (CPC) has actually exceeded the spike of October 2014, suggesting fear and panic are at higher levels now than back then. Sharp peaks in the CPC typically signal market bottoms. But even if the market rebounds sharply, that doesn't necessarily signal the return of higher highs. Recent lows in the CPC signaling extremes of complacency did not result in new highs; the market has been range-bound for months. This suggests the Bull is tiring--even if price pops back up. The SPX MACD has worked its way down to the neutral line, threatening to punch through to negative territory. Bad things tend to happen when MACD stumbles below the neutral line, and that suggests the next decline might be different from the spike-down-snapback pattern of last year. Is it time to get into Crash Positions? It never hurts to be prepared, but if the market pulls another October 2014 snapback here, the market could enter a glide path rather than a tailspin. Keep an eye on the fuel gauges. Maybe this flight won't go into a tailspin; perhaps it simply runs out of fuel. Thank you, Chuck R. ($200), for your beyond-outrageously generous contribution to this site-- I am greatly honored by your steadfast support and readership.